Neo-Pure MB-25048-05 is a High Efficiency 2-1/2" Polypropylene Sediment Depth Filter, which is a reliable and economical solution for pre-filtration in many applications. The 2-1/2" sediment depth filter, like FCRO cartridges, offer greater surface area for longer life and greater dirt holding capacity. 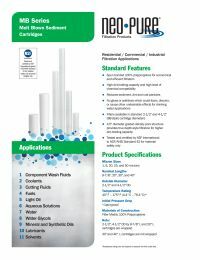 Neo-Pure MB-25048-05 filters are listed for food contact applications in Title 21 of the U.S. Code of Federal Regulations.